Apple today has been granted a patent by the United States Patent and Trademark Office regarding an "avatar editing environment," which is the company's patent terminology for a Mii-like app that users can visit to craft a digitized likeness of themselves to use throughout the Apple ecosystem. The patent was originally filed back in October 2011 but was just published by the USPTO today (via Patently Apple). Apple's patent explains that its avatar editing environment would let users create "a representation of their alter ego." This includes a collection of editing features such as different eyes, ears, mouth, skin color, hair, teeth, smile, facial expressions, eyebrows, hair, beard, glasses, hats, and even more items related to the expression of each person's unique identity and fashion. While Apple's new patent sounds like a basic Avatar editing system, the company's wording goes into deeper detail about how far and wide the digital personalities might be implemented across its services. The editor would primarily be its own application on iOS devices, but the patent also notes that Apple could add it as an online addition to its website and give its API to developers so they could implement the avatars into games, social networks, and more. Once an avatar is created, the user would then discover the character can be placed -- and even animated -- in a number of iOS locations, including in Messages, Address Book, and FaceTime. In Messages, users could set a specific animation of their avatar to trigger in response to certain events, so while you're waiting for a text from a friend your avatar could be animated on their screen to be tapping its foot in impatience, or sleeping. In execution, some of Apple's avatar features sound similar to the popular Bitmoji app. The patent also describes a feature where a user's face would be replaced in video chat, likely within FaceTime, by the avatar that they have created with Apple's editing system. The character would then be able to track and replace the user's expressions, eye movements, head, and body language, much like the technology created by Faceshift, which Apple acquired two years ago. Like all other patents, the avatar editing environment described here is unlikely to see the light of day any time soon, if ever. 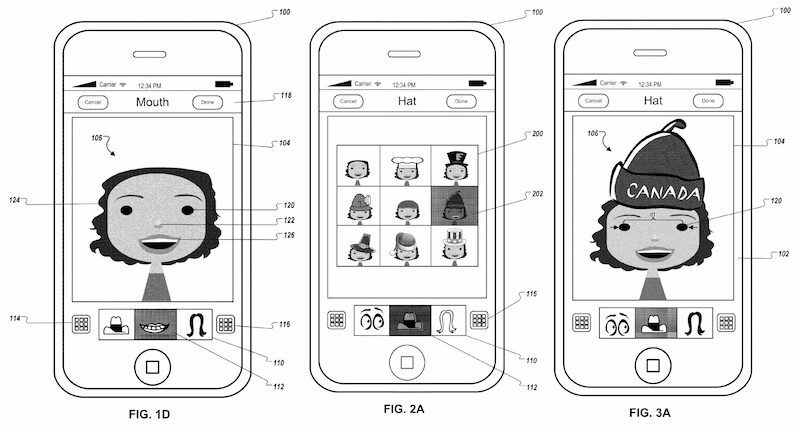 Although the patent mentions that users could manually and automatically generate an avatar, it never directly specifies if that would include using a future iPhone's advanced camera system to map the user's face and generate a close approximation in digital form. According to analyst Ming-Chi Kuo, the iPhone 8's front camera will be able to fuel experiences just like that, and might lead to gaming-enhanced 3D selfies and even experiences in augmented and virtual reality. Apple love emojis more than most of their customers and all their competitors, so they seem likely to do something with avatars. This sounds fun to me. I can simultaneously want a new Mac Pro and like avatars, kind of like walking and chewing gum at the same time. I suppose options are always good, but for myself, I'll probably use it about as much as I put stickers or fireworks explosion in my texts, which is never. Spend your energy on something more useful! That'd be a great thing to copy from Nintendo, Mii's are great in games and messages. Whilst they're at it if Apple could copy Streetpass from Nintendo too that'd be good. I think this would be fun. I work in a high school and can tell you first hand, emoji are becoming like a second language. This depresses me more than almost anything. Given the current administration it's just a case of giving up and making emoji an official higher education exam, degree and masters course. More nonsense gimmick trash, let the kids have their toys. Meanwhile Apple can't get multi-user facetime working. finally! screw you android, we have personalized avatars. win! :rolleyes: but hey, why not.